Vivi-Tone Acoustic-Electric Guitar (1933), made in Kalamazoo, Michigan, serial # 263, Cremona Brown Sunburst varnish finish, spruce back and top, maple rims; mahogany neck with ebony fingerboard.. 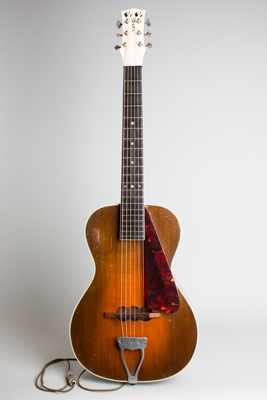 This extremely rare Vivi-Tone guitar is a fascinating example of Lloyd Loar and partner Lewis A. Williams' pioneering efforts in the creation of electric fretted instruments in the early 1930s. The design is utterly unique, as well as being one of the earliest electric Spanish-style guitars ever commercially made. The Vivi-Tones were predated only by the lost Stromberg-Voisinet electrics that are virtually unknown, and the very earliest Rickenbacker Electro models. Loar himself played primarily mandolin family instruments, so one can assume creating an electric Spanish guitar was a project he had more personal interest in at Vivi-Tone than the Hawaiian style that was the raison d'etre at Rickenbacker. Despite its eccentric design, this is a very well-made and playable instrument with a fascinatingly engineered and complex, if somewhat primitive, pickup system. This guitar was designed to function as both an acoustic and electric instrument, unlike Vivi-Tone's contemporary plank-like solid-bodies that were purely electric. The construction of the guitar itself is the same as Vivi-Tone's "Acousti-guitars"; by this point, the company had rationalized their production process and could build either an electric or an acoustic to order from the same instrument. The body is a thick-rimmed, standard-shaped affair with a sunburst finish solid spruce top and back. This radical design almost turns the guitar inside out; in the acoustic mode, the arched solid spruce back is the soundboard as much as the spruce top. The laminated rims are very heavy to prevent any vibration, and the back is recessed into them to avoid contact with the player. The only sound hole in the top is under the substantial maple and ebony bridge -- filled in with the pickup -- while the back carries two small f-holes. This guitar is built of high grade materials to a very high standard, certainly in a class with Gibsons of the era. The subtle hand-rubbed sunburst on the top, back, and rims is similar to 1920s Loar-era "Cremona Brown" Gibson finishes. The neck is shaped somewhat similarly to old Gibson necks with a heavy "V" profile, bound ebony fingerboard, and pearl dot inlay. The narrow headstock is ivoroid veneered with a screened "Vivi-Tone" logo and the individual Grover tuners have metal "butterbean" buttons. The lovely sunburst top is triple-bound, and the heelcap is ivoroid. The cast metal tailpiece carries a very Art Nouveau "Vivi-Tone" logo; the pickguard is heavy tortoise celluloid raised above the rim. The bridge has a compensated ebony cap. The electronics are mounted in a removable drawer which slides out of the bass side of the rim, with the signal transmitted from the wooden bridge to a metal plate sensed by a pickup beneath. This is a very late example, and (from the factory) uses a pre-made off-the-shelf telephone transducer as its pickup coil. Mr. Loar had certainly moved on in his theories since his time at Gibson and here created one of the most eccentric, as well as earliest, of all electric guitars. Sadly the 1930s electric revolution came too late for Vivi-Tone, the company only lasting a very short time but leaving behind some of the most unusual guitars ever built, both acoustic and electric. This Guitar's acoustic sound is surprisingly loud for so small a body (Loar wasn't COMPLETELY out of his tree) and carries extremely well. The amplified tone is functional but low powered, and the rather inefficient and completely microphonic pickup would never equal the contemporary Rickenbacker unit that was its primary competitor. Although a blind alley in guitar evolution, this Vivi-Tone Guitar is still a fascinating creation with a unique musical personality. Overall length is 39 1/8 in. (99.4 cm. ), 13 1/8 in. (33.3 cm.) wide at lower bout, and 3 3/4 in. (9.5 cm.) in depth, measured at side of rim. Scale length is 24 1/2 in. (622 mm.). Width of nut is 1 7/8 in. (48 mm.). Overall this is a clean and original example, showing some wear but no major repairs or alterations. There are spots of general wear to the finish overall, most notably to the top on the upper bass bout where some wear into the spruce has been touched up a bit. The frets look little used and the guitar plays well, at least by Vivi-Tone standards, and is functional in both acoustic and electric modes. The rather inefficient pickup is fairly weak by modern standards, but the sound has an echoing otherworldly character to it. A very rare and historically interesting guitar. One of the nicer Vivi-Tones we have had (and we've had more than most! ), housed in a period chipboard case that may be original. Excellent Condition.